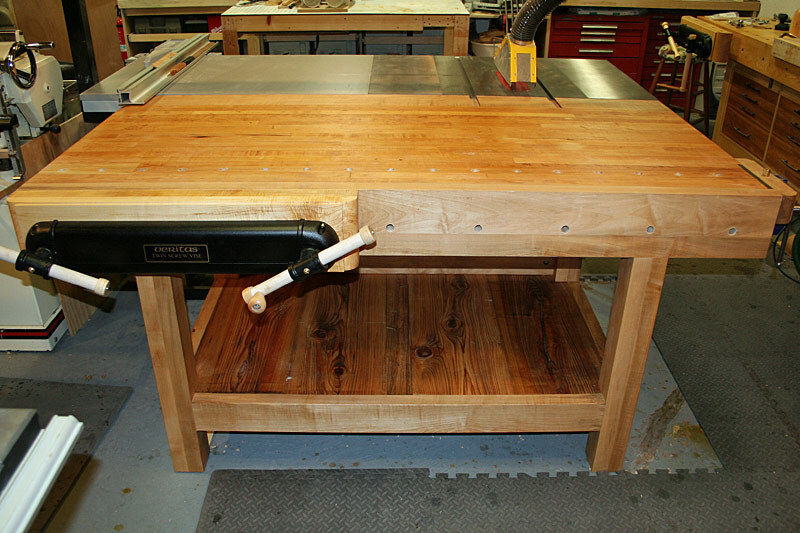 I just finished replacing my old outfeed/assembly/downdraft table with a new outfeed bench. The old multitasker had served its purpose but was showing signs of age. And I don't use the downdraft table anymore since getting a nice vac to hook to my sanders. 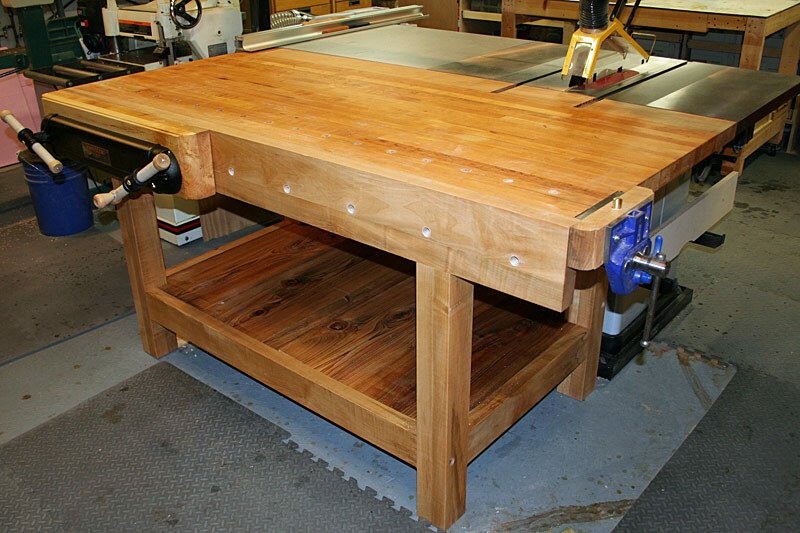 I was lucky enough to inherit a 28" x 72" x 1-3/4" hard maple benchtop that I built this bench around. The top was split in two places and had seen a lot of wear in a factory setting so it took some work to rehab it back into one piece and flat. I added a hard maple extension to the back of the slab so that the table is wide enough to support 8' rips off my tablesaw. 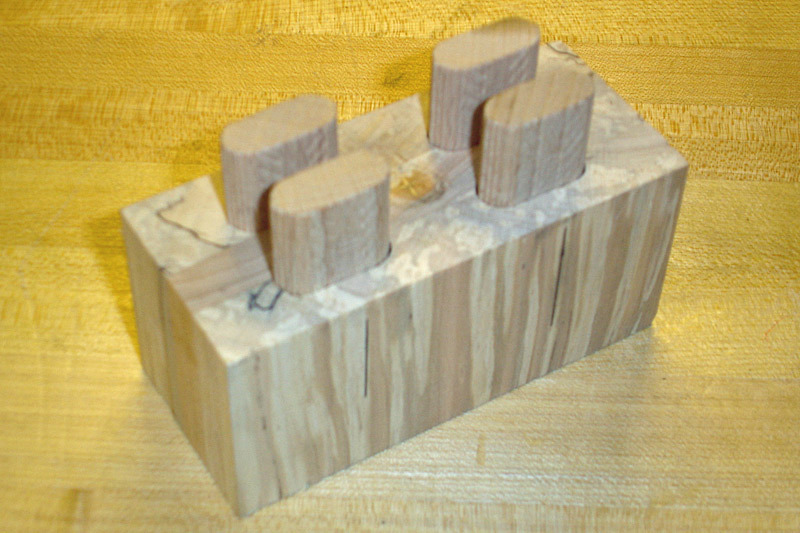 The rest of the structure is a mix of 8/4 hard and soft maple. The shelving is my last few quasi-decent cypress boards from a SEMIWW lumber purchase many moons ago. The design is a mix of Hotzapffel, Nicholson, Schwarz, Amrine, and Billman. You bench aficionados will be able to spot the various influences. The finish is a few coats of home brew danish oil. The face vise is a Veritas twin screw with 24" on center, and the end vise is a Record quick release. Dog holes are 3/4" round. Time will tell if I enclose the base in some manner, but I'm gonna give it a try as an open shelf first. The base is constructed with quad Dominos (see pic below) and bench bolts, and I'm amazed at how stable this thing is for such a quick and easy construction method.